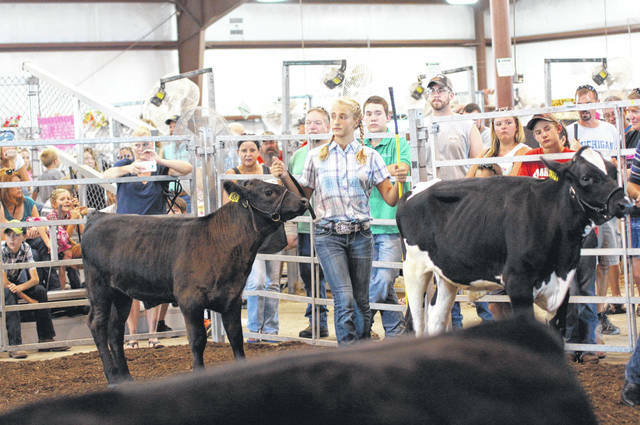 File photos Taylor Linebaugh, now 14, is no stranger to the Greene County Fair. Last year, Taylor Linebaugh walked away from the fair with a dozen awards: Market Steer Class Winner, Market Steer Div. Winner, Grand Champion Market Steer, Champion Senior Market Beef Showmanship, 4-H Feeder Heifer Class Winner, Breeding Heifer Class Winner, Breeding Heifer Reserve Champion, Intermediate Feeder Calf Showmanship Champion, Market Barrow Class Winner, Market Barrow Div. Winner, Champion Crossbreed Market Barrow and Reserve Champion Overall Market Hog. JAMESTOWN — For Taylor Linebaugh, getting ready for the next Greene County Fair starts when the fair ends. When she says ‘yes’ to another year of 4-H, she knows what’s ahead of her: a full year of working in the barn. “It’s lots of long days, late nights and early mornings with them really,” she said of her market steer, market heifer and feeder calf that she’ll show this year. Linebaugh, 14, of Jamestown will soon load up her animals for her sixth fair. Mornings for the Greeneview High Schooler begin in the barn at 6. She feeds the animals, walks them and washes them. Throughout the day, she checks on them and makes sure their pens are clean. Before bed, she walks and rinses them. But she’s not always alone in her efforts. Moffitt said he helps with the finances, but the rest is up to her. 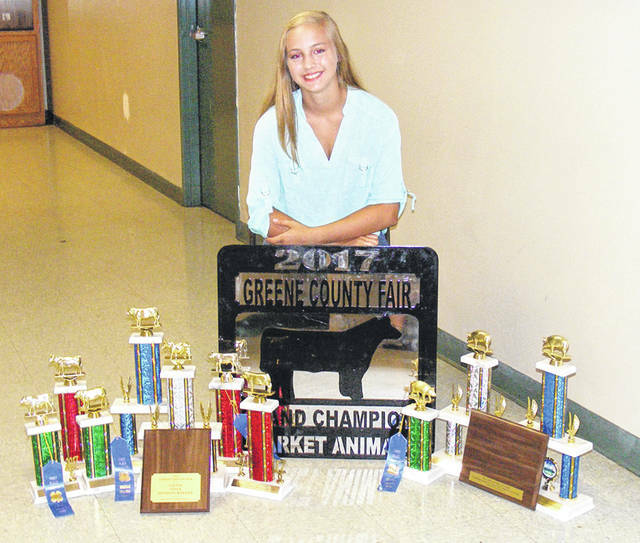 Linebaugh, a member of Farmers & Friends 4-H Club, left the fair last year with a dozen trophies and plaques for her cattle and hogs — including the prize for a grand champion market steer. Linebaugh may credit her success to the number of hours spent in the barn, but one of her show secrets is a simple, quiet one. “I talk to them a lot to keep them calm,” she said. Now with less than a week until the fair begins, Linebaugh is gearing up for competition. https://www.fairborndailyherald.com/wp-content/uploads/sites/50/2018/07/web1_TaylorLinebaughCattle.jpgFile photos Taylor Linebaugh, now 14, is no stranger to the Greene County Fair. https://www.fairborndailyherald.com/wp-content/uploads/sites/50/2018/07/web1_LinebaughTaylorAwards.jpgLast year, Taylor Linebaugh walked away from the fair with a dozen awards: Market Steer Class Winner, Market Steer Div. Winner, Grand Champion Market Steer, Champion Senior Market Beef Showmanship, 4-H Feeder Heifer Class Winner, Breeding Heifer Class Winner, Breeding Heifer Reserve Champion, Intermediate Feeder Calf Showmanship Champion, Market Barrow Class Winner, Market Barrow Div. Winner, Champion Crossbreed Market Barrow and Reserve Champion Overall Market Hog.